IPG (New Chapter Press) - March 2009, 284 pp. 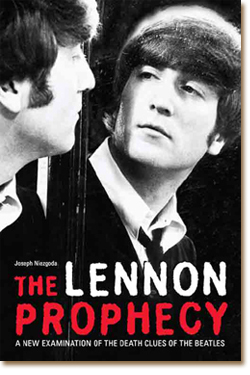 A book by Joseph Niezgoda - The Lennon Prophecy, A New Examination of the Death Clues of the Beatles - makes a good case for John Lennon making a pact with Satan in exchange for fame and fortune. The author is a first generation Beatle fan, has read every book out on the rock group, and admits conflict with his love of the music and the evil that he perceives surrounds it. His book – a 15-year project - was an effort, he said, to try to define or make sense of that evil. In fact, this is the book I was always planning to write about the Beatles. Since I threw out my Beatles albums along with the rest of my rock music many years ago, I’ve been gathering facts about the clues and signs of a Satanic link, evidence of camaraderie with occultists and their dabbling with the occult. Believe me, plenty exists. There is nothing new in the facts Niezgoda presents – they were all out there. He just brings “the clues” – as he calls them – together to make a convincing case of Lennon’s pact with Satan. I believe it’s a valid thesis, although I would go further and say the other Beatles’ also signed the contract. Throughout the book, he certainly implicates the whole group as linked to the occult. Niezgoda starts his book with the well-known remark Lennon made to his friend Tony Sheridan in the mid-1960s: “I’ve sold my soul to the Devil.” In the next chapters he goes on to show how this nobody group of British miscreants rose to fame: It is explained by a pact John Lennon made with the Devil for fame and fortune. When was the pact made? Niezgoda pinpoints the date - December 27, 1960, the night the Beatles played at the Town Hall Ball Room in Litherland, England. Lennon was a 20-year old wanna-be rock star in a mediocre band not so different from so many others at the time. He was desperate to “be more famous than Elvis.” Desperate enough to sell his soul to the Devil, Niezgoda contends. During that performance, Niezgoda reports, “the Beatles evoked a response noticeably different from anything in their past.” As they played, the crowd unexpectedly surged onto the stage and the girls started to scream. It had never happened before, but it would always happen afterward. It was the birth of Beatlemania. All four have noted this night as the turning point in their careers. Even though I have no specific study on the topic to object to this date, I believe it more likely that the pact was made some days before that date. This would give the Devil time to prepare the fans for that exaggerated reaction on December 27. Niezgoda also says that this gig marks the beginning of Lennon's avowedly anti-Christian behavior. From biographies of Lennon, he presents many profane acts Lennon carried out publicly with no apparent purpose but to blaspheme Christ. 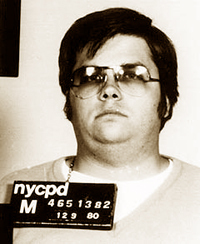 Twenty years later on December 8, 1980, Mark David Chapman fired five shots from a revolver at Lennon in front of the Dakota building in New York, where Yoko and John had an apartment – on the same floor, by the way, where Rosemary’s Baby was filmed. Lennon died shortly afterward. If John had entered into a 20-year pact with the Devil for wealth and world fame, that contract ended that day with his violent death. Mark Chapman would later claim he was instructed to kill Lennon by a voice in his head that kept insisting “Do it, do it, do it.” Five years later at Attica State Prison, Chapman asked for an exorcism to be made by a priest. He said he was delivered from five or six demons. Much of the book is an examination of “the clues” left by the Beatles themselves on album covers and in the music – clues that point to ties with the occult and the theory that Lennon knew the time and place of his death. To demonstrate his thesis, he follows a well-documented trail of sorcery, mysticism, numerology, backwards masking, and anagrams. He claims that clues foretelling the death of Lennon are revealed in album covers such as Rubber Soul, Yesterday and Today, A Collection of Beatles Oldies, Sgt. Pepper’s Lonely Hearts Club Band, Yellow Submarine, Magical Mystery Tour, Abbey Road as well as Lennon solo albums Imagine and Walls and Bridges. In my opinion, you have to stretch a bit some of these clues to arrive at his thesis. But putting them all together, one finds the evidence compelling and even a bit frightening. For example, the album cover of The Beatles Yesterday and Today, released in 1966, may say nothing about Lennon’s death, but it literally shouts that the so-called Fab Four were involved in Satanism. 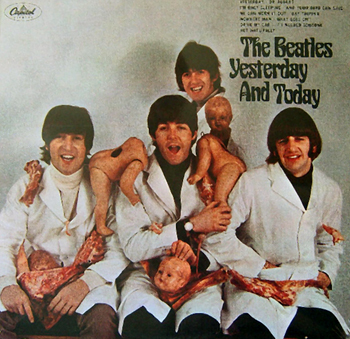 Called the “butcher cover”, in it the Beatles pose in butcher smocks with raw meat, eyeballs and decapitated babies draped over their laps and shoulder. This horrendous picture clearly refers to the kind of infanticide that takes place in Satanic rituals and Devil worships, Niezgoda affirms. It is the only credible way I see to explain the message of the picture – it’s surely not just avant-garde art. Take a look yourself and see if you would say it’s just merry pranksters making a joke, as some Beatles’ fans pretend. The author also finds many “clues” in lyrics that also reveal the mysterious prediction of Lennon’s death and connections to the Devil. It’s not so ludicrous as you might think. Songs often came to Lennon in dreams – and usually became major hits. It’s why he always kept a pad of paper and pencil nearby. As Niezgoda insists, there is nothing in this book that is not already in the public domain. All he did was connect the dots, and the resulting picture reveals occult links and the strong possibility that the Beatles had preternatural help in their rise to fame. Would I suggest reading the book? No, for Catholics who already realize rock music is bad. It isn’t worth the time. But yes, for Catholics who still listen to and love their Beatles’ music. If they can become convinced of the source of the group’s fame, they may finally become frightened enough to throw away their Beatles’ music. Why Are These Teens Screaming?